Wire cages with a solid bottom and a deep pan are often used as hedgehog cages. They are well ventilated, easy, and safe to heat using a ceramic heat emitter. One advantage of wire cages is that they are specially designed for ground dwelling animals such as guinea pigs, rabbits, and hedgehogs. Another advantage is that there is more floor space than in an aquarium, bird cage and some modified cages. Cages of this type are strong enough to adequately house hedgehogs and most are able to protect them from other pets and small children. There is, however a huge difference in the quality and some brands are easily damaged in daily maintenance. Pans that are six inches deep or deeper are preferred to more shallow pans. 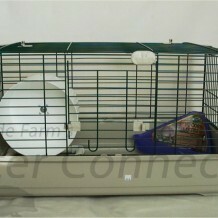 Deep pans not only contain the bedding within the cage but also discourage the hedgehog from climbing. Plastic pans are generally preferred over metal pans. Both are lightweight but plastic does not rust and it will maintain its integrity over time. Metal that has begun to rust is harder to clean and disinfect than plastic. Metal will also conduct heat much differently, which may be a problem when trying to provide additional heat sources for your pet. Wire floors are not acceptable for hedgehogs. Their tiny feet can get caught in the wire and it is very difficult for the hedgehog to walk. Some hedgehogs are tempted to climb the sides if the pan is not deep enough. This is dangerous because the hedgehog can tangle its foot or fall from the top, escape, or be so persistent that they rub a sore on their nose. Should you notice that your hedgehog climbs the wire of the cage, you will need to line the bottom edge of the cage with a smooth material that discourages climbing. Hedgehogs won’t chew on the lining so a variety of options will work well. A quick fix to prevent climbing is a lining the bottom six inches of the wires with cardboard and duct tape on the inside of the cage. This doesn’t look pretty but it will work in a pinch. A simple and economical solution is to purchase heavy vinyl table cloth material found in a fabric store such as JoAnn Fabrics. Most stores are willing to cut the material in 6″ strips to make the lining process much easier for you. Clear packing tape will secure the vinyl and is less noticeable than other options. Lexan is a clear material found at most home improvement super store. It can be easily cut with tin snips, shaped, and molded to fit your cage. Plexiglas and acrylic are very durable but fairly difficult to cut and are relatively expensive. Coroplast is a sign making material found next to the poster board in most stores. It is cheap and easy to cut, however it is solid and can inhibit hedgehog visibility. Some breeders recommend ½” wire spacing to prevent the hedgehog from getting their head stuck between the wires of the cage and to prevent babies from escaping. However, this type of wire spacing is much more difficult to find. Most owners find that when babies are about 200 grams in weight that they are not able to escape through cage bars. Coated wire is absolutely the best for longevity of the cage. The deep pans on our cages tend to prevent climbing and general head poking so the wire on our cages does appear to be adequate even though the bar spacing is farther apart. Why Do We Believe Marchioro Cages Are The Best Wire Cage? We have tried countless cage options over the years and have been remarkably impressed with this style of Marchioro cages. The cage pans are made from a higher quality of plastic than any other cage we have found. 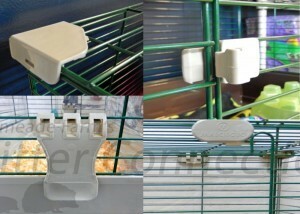 Many brands of similar cages have pans that are made of thinner and more brittle plastic. The plastic seems to be more scratch resistant and therefore easier to clean. Hedgehogs are not typically hard on the cages but we certainly want something that will withstand cleaning and transporting. The wire on all Marchioro cages is a very high quality. The wire top is not easily bent and has a high quality powder coating. We have travel cages that we have been using approximately 15 years that look amazing after such an extended use. No other cage on the market comes close having this kind of track record with us! 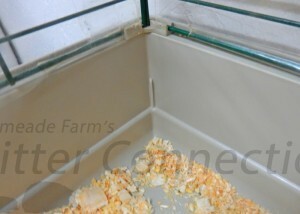 Another feather that improves the durability of the cage are the plastic parts that come with each cage. Again, the same durable plastic is outstanding. We have put literally hundreds of cages together over the past 16 years and is rare that we find a damaged or misshapen part (which is inevitable with plastic from time to time). Each top corner is held together with a two-part connector and the bottom corners are held together with a corner bracket. This is an extremely nice feature of the cage corners. Most cages have a gap in the corner and around doors where little feet and legs can get stuck and injured or broken. Another impressive feature of this cage are the door locks, brackets that hold the top to the pan, handles, and braces that hold/join the top and/or sides. Again, these features set this cage apart from other options. Our children have climbed on the cages, sat on the cages, and played inside the cages. Your hedgehog will not be as rough as our children, but a tough and durable cage will last longer and be an overall better value for your dollar. These cages are not going to be the cheapest on the market. However, their quality is well worth paying a little extra. 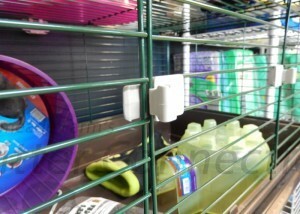 Hey I was just reading your post on the cages, one thing I tell people as a selling point over the super pet cages, etc, is the vertical length of each corner is tight together on the Marchioro cages, where on super pet there is always a gap. The super pets were all I was using for quite a while before I went to sterilites and I had one of my males get his leg hung up in the corner, also where the door closes the Marchioro cages don’t have a gap there either like the super pets do, I had a momma get her front leg caught in there and ended up with stitches and nerve damage 🙁 That’s when I quit using the super pets.